Steven Anthony Ballmer was born on 2 March 1956, in Detroit, Michigan USA, of Belorussian-Jewish (mother) and Swiss immigrant (father) descent. He is a businessman and manager, perhaps best known to the public as a former CEO of one of the largest multinational corporations – Microsoft – but now also as the owner of the Los Angeles Clippers basketball team in the NBA. 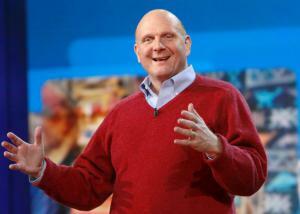 A well-known businessman, how rich is Steve Ballmer? According to sources, Steve’s net worth is estimated to be $24.1 billion, accumulated during his managerial career, particularly his 14 years as CEO at Microsoft, but also through the Clippers , for which he paid $2 billion in 2014 and at which the team is valued as of early 2016. Among Ballmer’s most valuable other assets is his house in Hunt’s Point, the value of which is put at $10 million. Steve Ballmer studied at Detroit Country Day School, then Lawrence Technological University, before enrolling at Harvard University, and graduating with a Bachelor of Arts degree in economics and applied mathematics. While studying, Steve Ballmer worked on “The Harvard Crimson” student newspaper, as well as a magazine called “The Harvard Advocate”. He joined Procter and Gamble in 1978 as a product manager, before being ‘head-hunted’ by Bill Gates in 1980. Under Ballmer’s watch, several important divisions, such as Xbox entertainment division and data centers division, were built, Skype acquired, and concentration directed to products with better potential rather than ‘nice-to-haves’. During his time as a CEO , Steve Ballmer managed to triple yearly revenue to $70 billion, increase net income to $23 billion, and gross profit to 75c in every dollar of sales. In short, Microsoft became one of the most important and profitable businesses in the world, so despite some criticism, Ballmer’s contribution to Microsoft were of enormous importance. Just one example is that Microsoft Office is estimated to be used by more than one billion people around the world. Steve Ballmer left the company in 2014, after some subsequent decisions proved not so profitable, but with an extremely healthy net worth. Steve Ballmer was featured in the drama film entitled “Pirates of Silicon Valley”, where he was played by John DiMaggio, while Bill Gates was played by Anthony Michael Hall. In 2002, a book under the title of “Bad Boy Ballmer: The Man Who Rules Microsoft” was published. Ballmer’s character was also featured in an episode of “South Park”. Steve Ballmer’s second love is basketball, and his wealth enabled him to indulge in the purchase of The Clippers in 2014, the team apparently being on a very secure financial footing. In his personal life, Steve Ballmer married Connie Snyder in 1990, and they have three sons. They are known philanthropists, and have donated considerable sums to both Oregon and Harvard Universities in particular. 1 He was the first man in history to become a billionaire from Microsoft Stock Options. He is the 2nd longest employee at Microsoft and the only person ahead of him is Bill Gates. He was the 24th employee to join Microsoft.